My Life in Concerts, Part 3 of 3: Classical Geeks « Midlife Crisis Crossover! 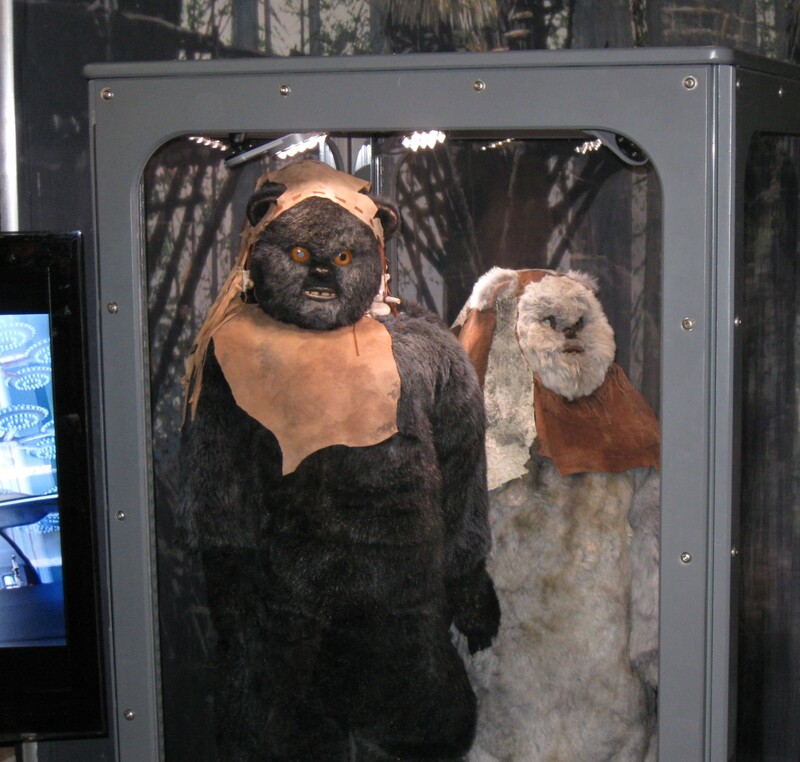 That time Conseco Fieldhouse hosted grotesque samples of Ewok taxidermy. Over the past few days, live performances have been on my mind for a couple of reasons I’ll get to at the end of this miniseries — to wit: my life at concerts over the past 25 years, mostly but not entirely rock-based, including a smattering of stand-up comedy and a pair of classical orchestras in more recent times. That number of years might sound impressive if I were a 30-year-old roadie and if the results were novella-length. As a 45-year-old introvert, I’m surprised they add up to as much as they do. The next two concerts in my timeline shared quite a few traits. Both were at the same venue in downtown Indianapolis. My wife and son accompanied me for a change. 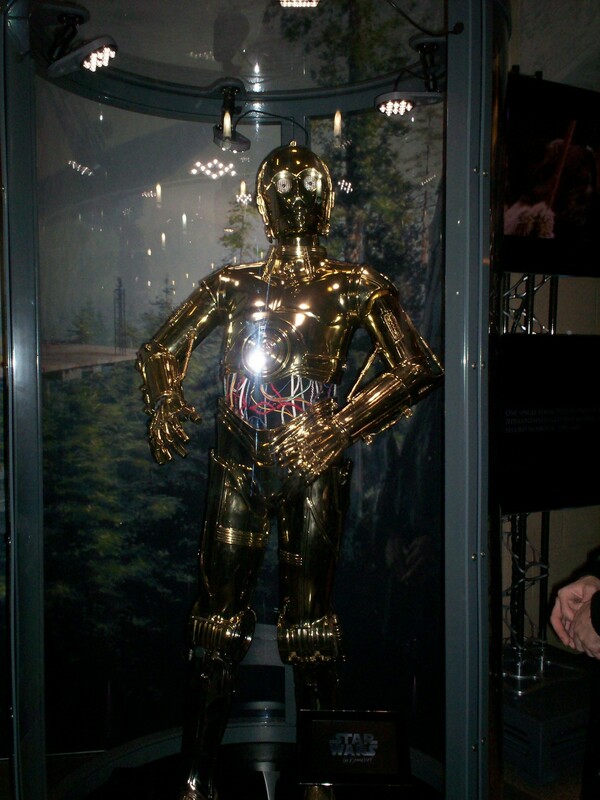 Both featured large orchestras, multimedia displays, and original scores from entertainment media. One of these presentations differed from all the other shows in this miniseries in a very noticeable way: we took photos! 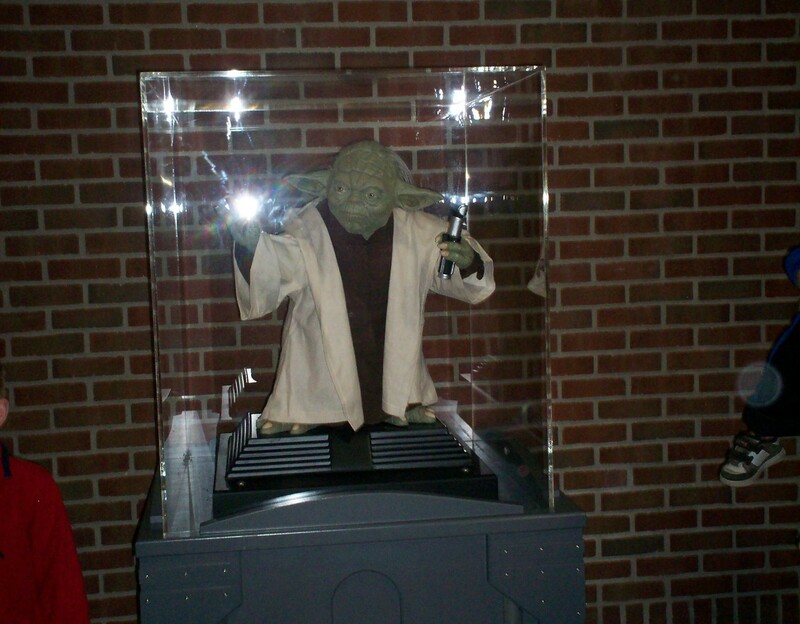 The display-case glare really works in Yoda’s favor. We sat on the left side of where our own Indiana Pacers play, one row away from courtside. The actual court had seats facing the orchestra and the big screen behind them, but our seats were still pretty good except whenever a huge lighting crane kept swinging in front of the screen and blocking our view during some of the Attack of the Clones footage. On the screen its shadow looked like one of the Geonosians was lurking in an arena corner with a giant backhoe. 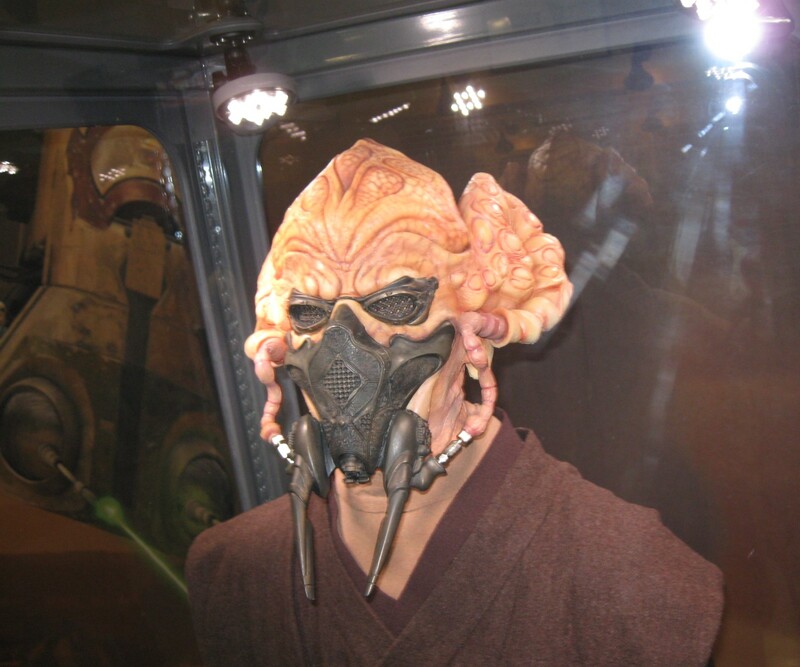 The actual mask and breathing apparatus of Plo Koon, short-lived Jedi. 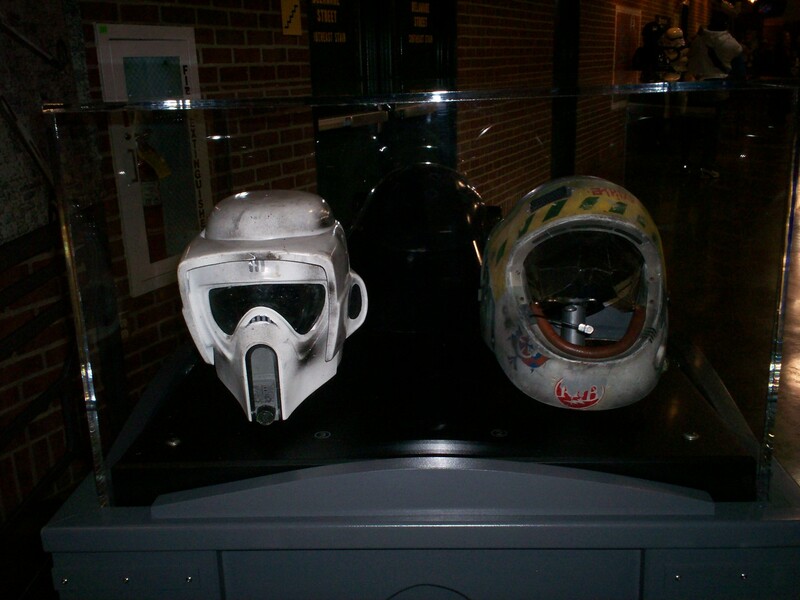 Around the Fieldhouse were a number of authentic Star Wars film props on display for the occasion. We walked from prop to prop and snapped decent pictures while people waited in lines for snacks or whatever. We got some ice cream and took our tiny seats. 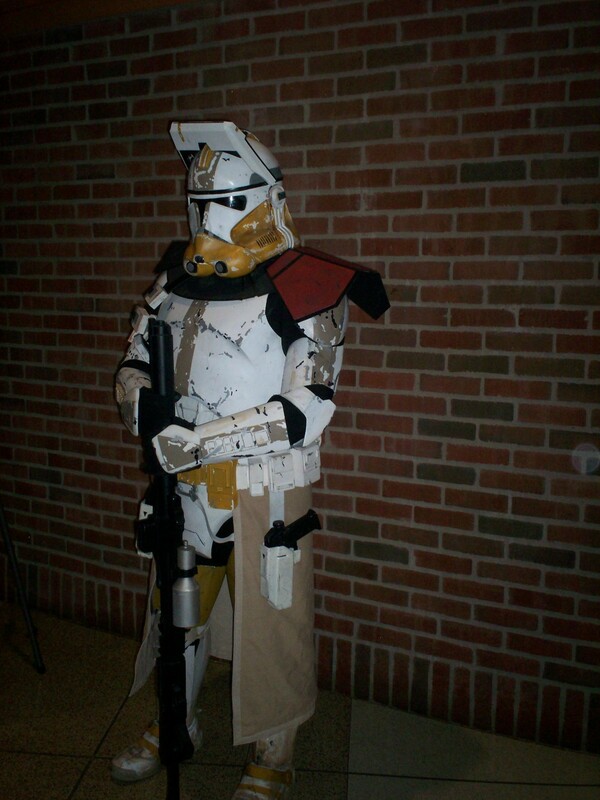 A few representatives from our local chapter of the 501st Legion were in the house, not as many as I expected. Or maybe they were just spread out really thin. It’s a pretty big place, as Indy venues go. Once upon a time, Anne could tell you the names of each Clonetrooper variant action figure. It’s been quite a while, though. …where were we? Oh, right, Star Wars. Blaster arsenal, not for sale, not even the ones that work. Behind the band played video footage clipped directly from trailers. To our annoyance, someone cued the same clips to appear behind multiple songs rather than creating individual montages for each. (How many time did we see teen Anakin giggling in the Naboo meadow? Three?) But Anne did like the way they retold the story. Our host for the evening, Anthony “Threepio” Daniels, brought his flair for the overdramatic in top form as always. He switched personae on a dime from Dead Serious Narrator to protocol droid riffing and back again. We made sure we couldn’t hear Mr. Daniels trapped inside and screaming before we moved on. We found no real surprises in the music chosen. The mandatory opening fanfare, Leia’s theme, Yoda’s theme, “Luke and Leia”, the Forest Battle, the Force theme, “Duel of the Fates” (with live choir), “Across the Stars” and “Battle of the Heroes”. I loved that the Cantina Band number gave the percussion section a chance to go nuts. Anne has always been a big fan of the Asteroid segment and loved hearing that music, but it was jarring to have that theme backed with prequel footage. We could take or leave the Jawa music. Naturally the encore was “The Imperial March”, which included a perfect moment when the second-chair cello looked directly into the crane-cam and gave the audience a sharp look of come-hither EEEEVIIIL. 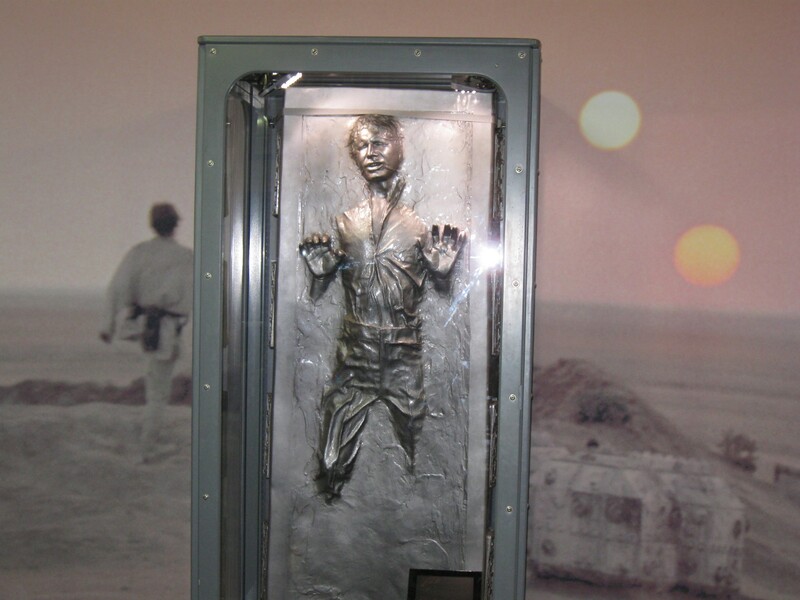 Han Solo, by which we mean HARRISON FORD, in carbonite. Also adding to the overall space-battle ambiance: EXPLOSIONS! We were close enough to feel the heat from pyrotechnics. 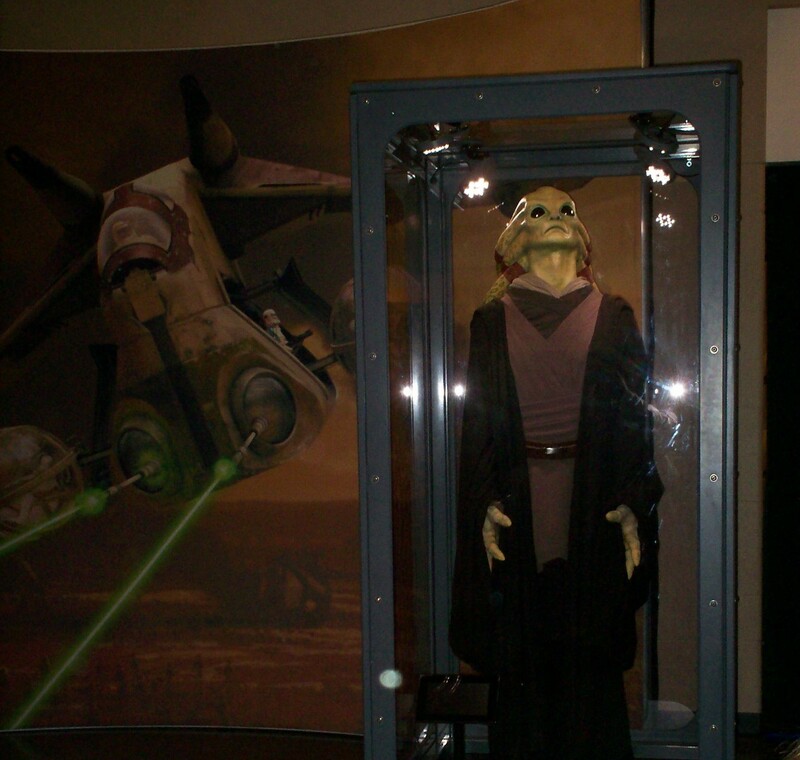 Kit Fisto, one of your cooler Jedi with no dialogue, next to a blow-up of the LAAT dropship’s picture from its Wookieepedia page. After the show came a series of not-so-endearing codas. We walked away with a complete lack of tangible souvenirs due to astronomical pricing. Anne would’ve loved to have a program and a stocking cap, but that would’ve totaled $55. After what she’d already spent on the tickets and Ticketmaster surcharges alone, our memories and these pics would have to do. Helmets that once touched the heads of real Hollywood folks. Then rinsed out, one presumes. We also came to loathe the parking garage we’d chosen near the Fieldhouse. During the half-hour wait through the ensuing traffic jam, I busied myself in this pre-smartphone era by reading several pages of a book I’d left in the car. All those underground exhaust fumes did me no favors, nor did the shouting match that happened a few car lengths behind us at one point. Live internet as street improv, with the same courtesy level and without the ISP charges. Freezing rain had threatened to cap off our night on a sour note. Thankfully it held off till we got home safely. 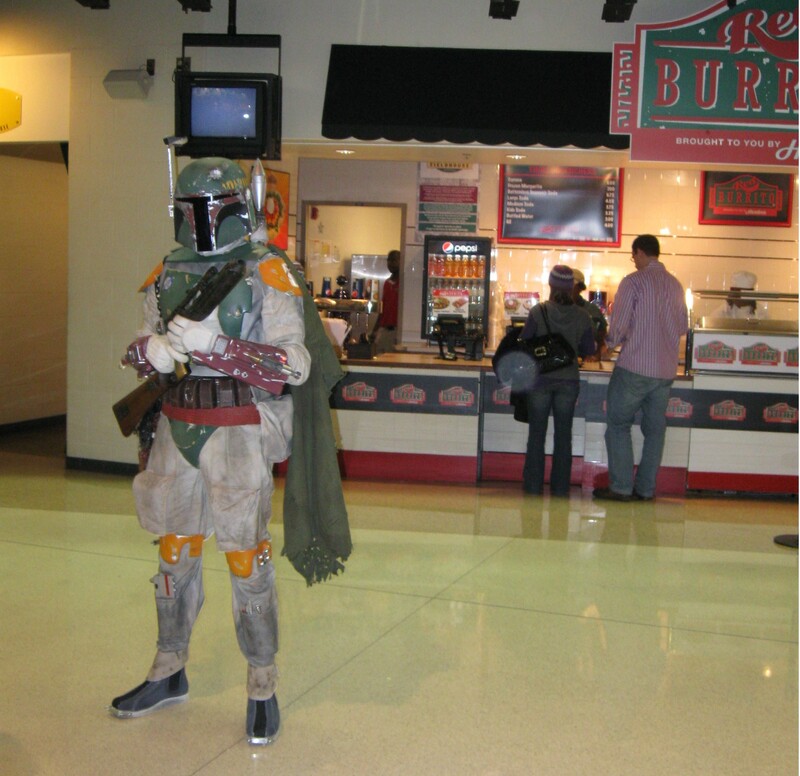 Boba Fett guards a Red Burrito stand, shortly before tripping and falling face-first into a fryer. I owe special thanks to Anne, from whom over half this remembrance was borrowed without asking. Funny thing is, we’d both forgotten these photos entirely till I stumbled across them in our archive. Suddenly our lost old memories are new again. Our least worst pic of the concert itself. We tried. Long unlit distances in large indoor spaces are not an amateur photographer’s friend. Another outing with Anne and my son, in which guitarist/impresario Tommy Tallarico led our own Indianapolis Symphony Orchestra for their third straight year here in Indy, scheduled as a shrewd promotional tie-in on the Saturday of Gen Con 43. Numerous gamers attended still in the costumes they’d been wearing all day. I regret the awful lighting prevented me from taking photos. Themes and scores were played from Halo, Assassins Creed II, God of War, Castlevania, Chrono Trigger, Shadow of the Colossus, and assorted versions of Mega Man and Legend of Zelda. For the commoners and other folks like us who hadn’t played a lot of those, the opening number was a medley of classic games starting with Pong and flitting quickly through Donkey Kong, Ghosts & Goblins, Gauntlet, Dragon’s Lair, Joust, Marble Madness, Tetris (this is where Anne’s eyes lit up), and several others. Later came a dead-on Super Mario tributem the closest to a mainstream hit single on the set list. I transcribed most of those names at the time and couldn’t tell you which was which in hindsight, either. The setup changed for a Guitar Hero demo in which some online contest winner took the stage and, while the orchestra did their thing, ostensibly played the game on super-extra-deluxe-mega-advanced difficulty level through Van Halen’s “Jump”. He seemed to win, but the entire display looked throughly rehearsed and preprogrammed. For my son and me the even bigger show-stopper was “One-Winged Angel” from Final Fantasy VII, which the two of us had beaten together earlier that summer. Hearing the Indianapolis Symphonic Choir chanting “SEPHIROTH!” with Gothic pomp and bombast went down as one of my highlights of 2010. They also played “Liberi Fatali” from FFVIII, but we hadn’t gotten to that next game yet. We expected to appreciate it later. To be honest, now I find it overrated. Also worth lauding: classically trained Internet/convention performer Laura Intravia, known in certain circles as “Flute Link”, was on hand to sing an aria from Assassins Creed II, lend vocals to a few other numbers, and later came out in her Link costume to show off her equally impressive flute skills during the Zelda sequence, along with a quick Super Mario 2 ditty and “Aerith’s Theme” from FFVII. She’s an extremely talented woman who deserved money and lots of it. A quick online check tonight confirms that yes, she did eventually get her own YouTube channel, though it’s been a while since her last update. Yet another ticket that was a birthday present from Anne. She’s awesome like that and will never, ever be described here as “oddly uncaring”. As for what the future may bring…good question. 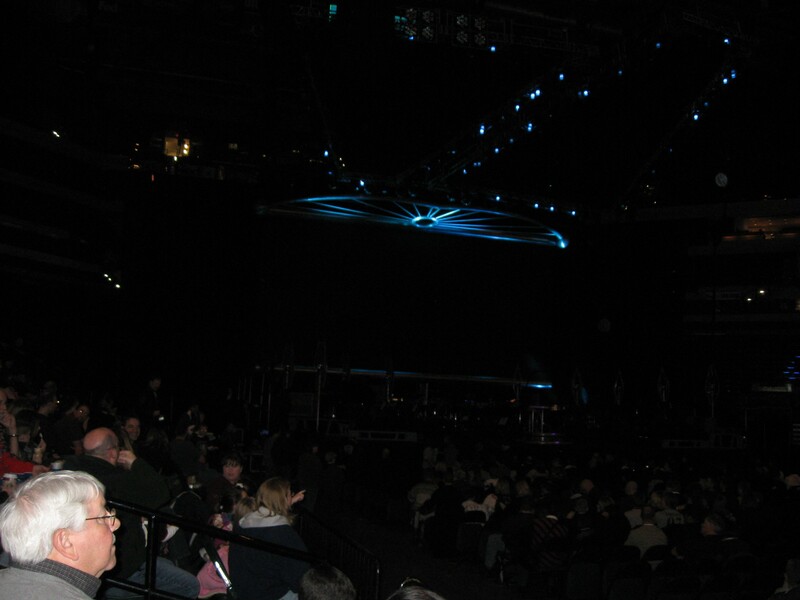 To be honest, I’ve come to loathe attending concerts alone…unless there are seats. Introversion and acute loneliness are more bearable to me around groups of happy people if I can at least sit down, physically relax, and have furniture as a light buffer between me and the mirth of other people’s parties. For this reason, and other factors coded into previous paragraphs throughout this longform miniseries, I missed They Might Be Giants when they returned to the mostly-standing-room environs of the Vogue this past Wednesday, February 7th. It wasn’t an easy decision because their new album I Like Fun is so far a keeper that surely sounds awesome live. But I couldn’t bear the thought of having my surroundings turning me grumpy in the midst of their contagious zaniness. On the upside, I recently learned that Henry Rollins (cf. the overlong Part Two) will be a guest at this year’s C2E2 and will be doing a spoken-word engagement on Saturday night that’s 90% sold as of this writing. Our tickets are already in hand for the con and the show. I can’t begin to express my stratospheric expectations for the occasion, so here’s hoping that all goes well, that Anne doesn’t mind their conflicting politics, and that there are comfy chairs.